Untitled, a photo by hazelonewhite on Flickr. MacDonalds / Byron Stewart, a photo by hazelonewhite on Flickr. How MacDonald’s use theatre to understand customer experience. protopartners _ zilver_ virgin, a photo by hazelonewhite on Flickr. Damian Kernahan, protopartners and Erik Roscam Abbing, zilver discussed working with virgin to improve customer satisfaction. 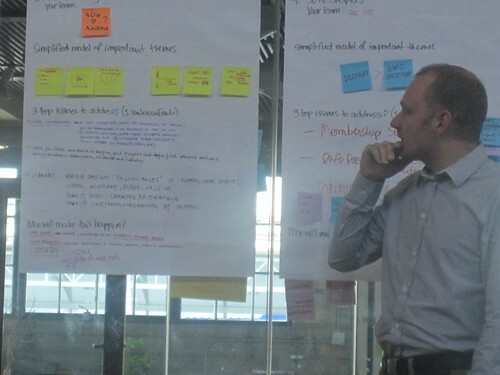 Protopartners describe themselves as a ‘keeping promises business’ rather than service design. How do you embed empathy in customer service? Then later informal chats in the Haight with Eric, Ross, Damian, Rishi, Aiden and Thomas. Nokia_Bas Raijmakers_STBY_DA Eindhoven, a photo by hazelonewhite on Flickr. Notes From Continuum/Forrester #SDNC11, a photo by hazelonewhite on Flickr. Richard Buchanan Notes, a photo by hazelonewhite on Flickr. Buchanan’s four domains of design summarised to posters, toasters, environment and now services. Thinking of management as a design discipline – how we organise ourselves to do the things we do is a design issue. Join us at Handmade: Digital | DIY | Craft to see designer Jo Hodge who is creating toys and clothing which allow parents and children who are separated through work, illness or family breakdown to communicate online. Jo and Hazel White, Director of the Master of Design Programme at the University of Dundee are running a drop-in workshop where you can try out Jo’s tweeting toys, her Skyping scarf and create your own designs. Jo and Hazel will be crowdsourcing ideas and asking people to vote on their favourite designs for interactive toys and clothes which Jo will make up and exhibit online at Pigeon Post. The workshop will explore how we might usefully integrate ‘the internet of things’ into our lives without becoming overloaded by technology.